Crop circles also show evidence of ultrasound, and such frequencies are known to exist at ancient sacred sites such as stone circles and pyramids. 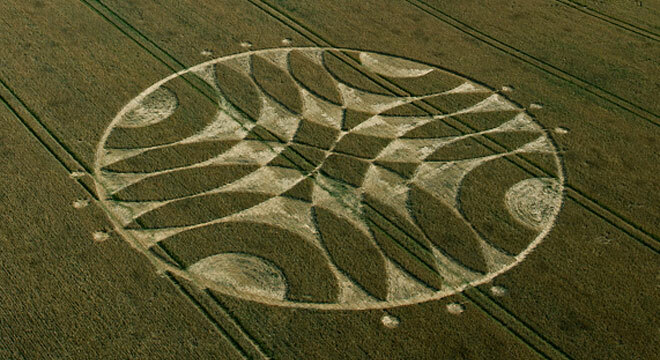 And like all temples, crop circles appear at the intersecting points of the Earth's magnetic pathways of energy. Consequently, it is not unusual for people to experience heightened states of awareness and healings in crop circles – a situation also common to sacred sites and ancient temples. Biophysical evidence shows the plants' seed embryos are altered, and the liquid in the stems has been heated from the inside. 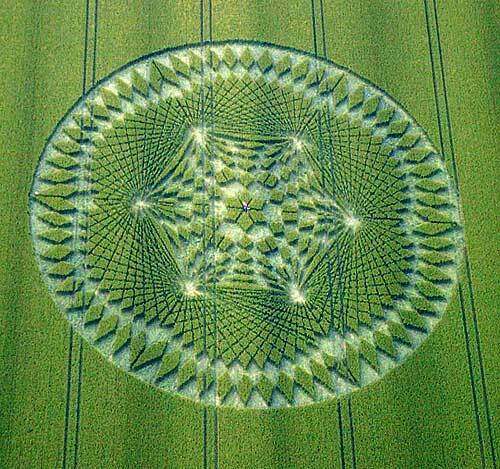 In genuine crop circles there is also a reorganization of the plant's crystalline structure. 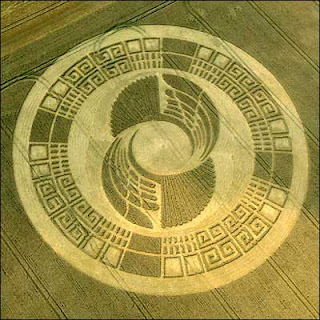 Other evidence from crop circles shows how the floors of laid plants are swirled in mathematical proportions relative to the Golden Ratio – the vortex used by nature to create organisms. 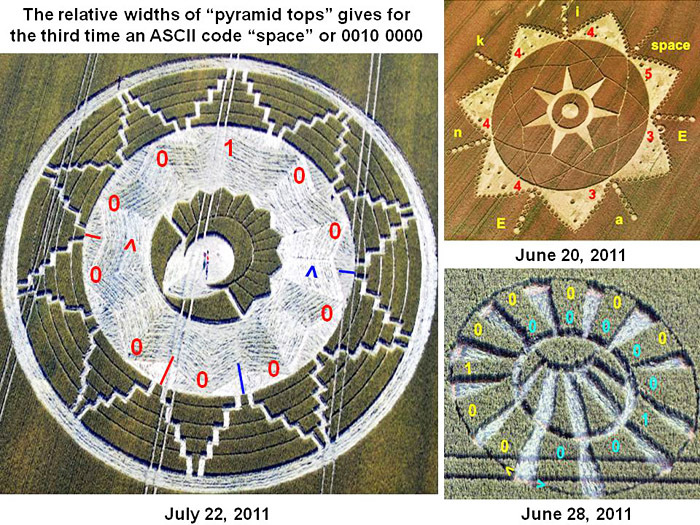 Mathematically, genuine crop circles have yielded five new geometric theorems based on Euclidian geometry. They are also encoded with sacred geometry – those harmonic ratios that govern the relationship between the orbits of planets. 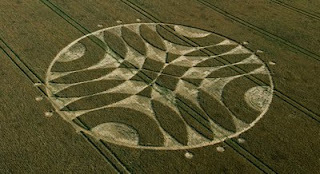 Crop circles alter the local electromagnetic field; affecting the proper function of compasses, cameras and mobile phones; the frequencies are also known to affect aircraft equipment." The 2nd question everyone wants to know is, "How are they made"? 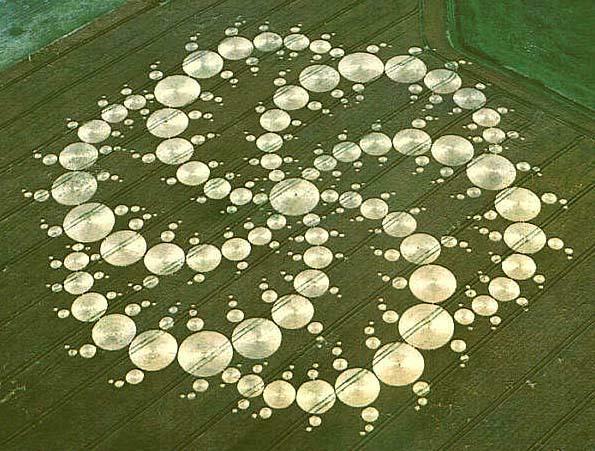 Here is a video of a crop circle being produced by 2 'orbs', it was filmed back in the 1990s. 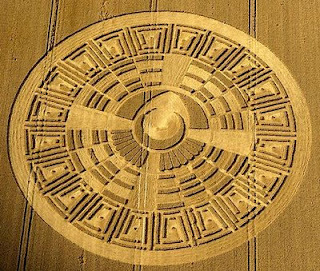 This video has been proved to be genuine and at least 80 witnesses have said they have seen similar 'orbs' making crop circles. 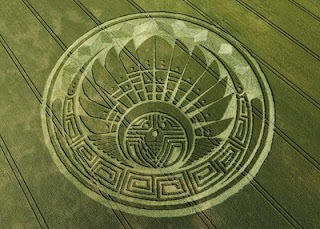 The year 2012 and the Mayan Prophecy of the shift of the ages is symbolized with the end of the Mayan Long Count Calendar in 2012 by the masters of celestial knowledge, time keepers of ancient times. 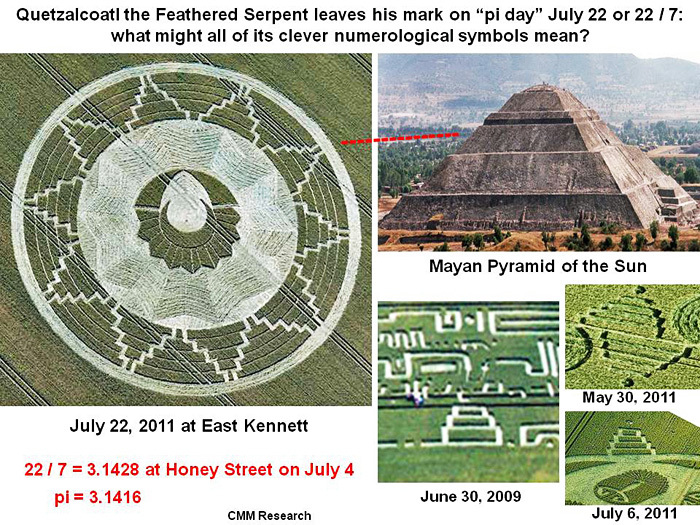 The Mayans had deep knowledge and understanding of the natural cycles of time in which life evolves. 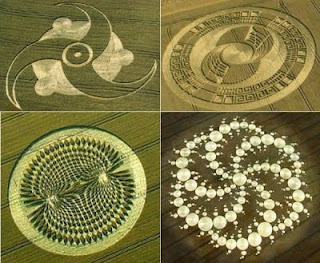 Here are some more crop circles related to the Mayans. 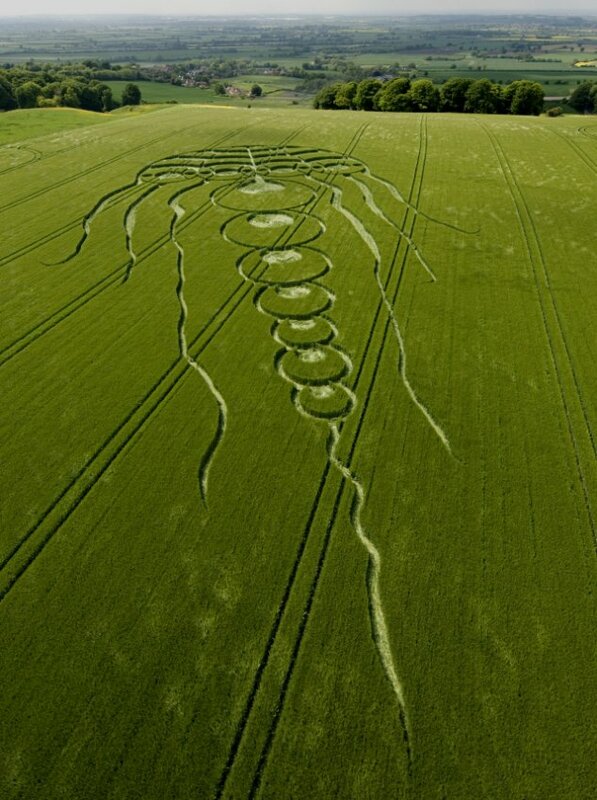 This crop circle in a barley field near Wroughton in Wiltshire is a coded version of pi., the experts say it is the most complex crop circle ever seen in Britain. The pattern appeared on 1st June 2011, near Barbury Castle, an Iron Age hill fort above the village of Wroughton in Wiltshire. Initially, crop circle enthusiasts were stumped as to its meaning and even a number of experts said it was 'mind boggling'. 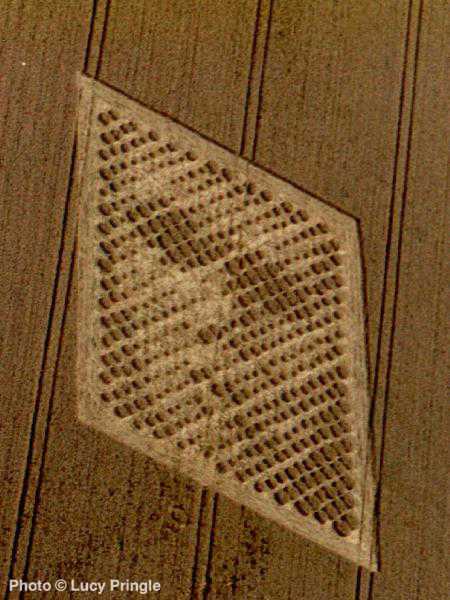 Then retired astrophysicist Mike Reed saw a photograph of it and made the mathematical link. 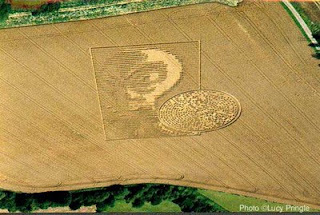 He said the crop pattern 'clearly shows' the first ten digits of pi, which is used to calculate the area of a circle using the formula Pi r squared. 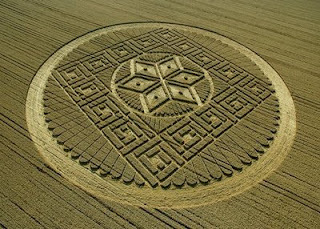 This latest crop circle has the crop circle world all abuzz. 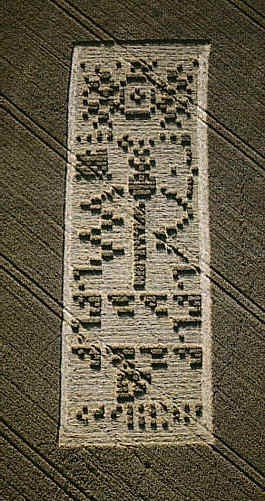 It’s about 300 feet long, found in Honey Street field near Alton Barnes, Wiltshire, England. The crop circle appears to be another complex structure depicting the mathematical number Pi, all the way out to 10 decimals! 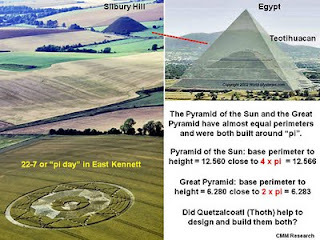 Are they telling us that they use the same mathematical functions as we do? 4th dimensional hyper-cube (metatrons cube) or tesseract. 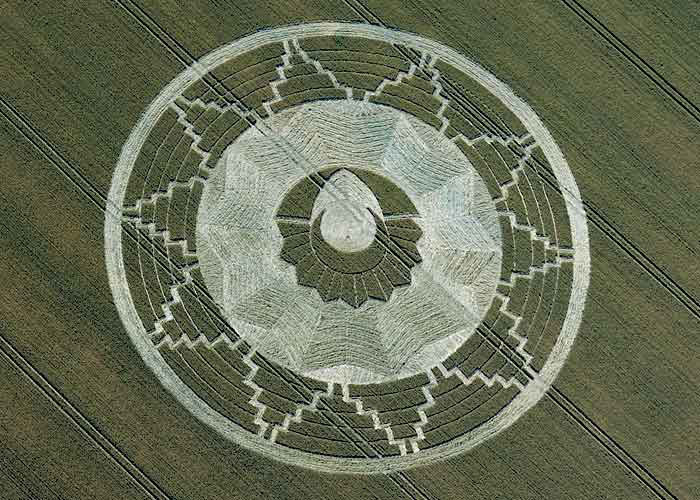 A crop circle in the form of a double (six-sided) Triskelion, composed of 409 circles and 878 feet across. 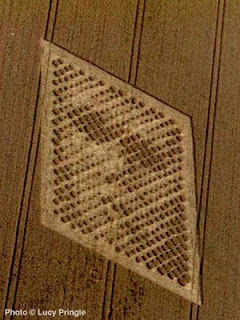 In 1974 NASA sent a message into space from a radio tower. 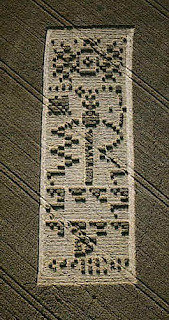 The Arecibo message was broadcast into space a single time via frequency modulated radio waves at a ceremony to mark the remodelling of the Arecibo radio telescope on 16 November 1974. It was aimed at the globular star cluster M13 some 25,000 light years away because M13 was a large and close collection of stars that was available in the sky at the time and place of the ceremony. 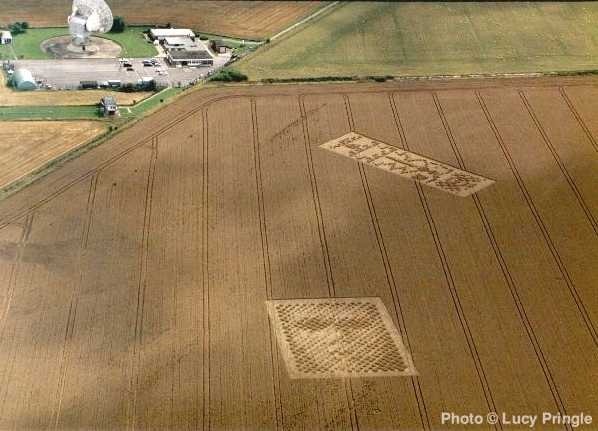 Dr. Frank Drake, then at Cornell University and creator of the famous Drake equation, wrote the message, with help from Carl Sagan, among others. The message consists of seven parts. This is a picture of what the message would look like. The numbers one (1) through ten (10) The atomic numbers of the elements hydrogen, carbon, nitrogen, oxygen, and phosphorus, which make up deoxyribonucleic acid (DNA) The formulas for the sugars and bases in the nucleotides of DNA The number of nucleotides in DNA, and a graphic of the double helix structure of DNA A graphic figure of a human, the dimension (physical height) of an average man, and the human population of Earth A graphic of the Solar System A graphic of the Arecibo radio telescope and the dimension (the physical diameter) of the transmitting antenna dish. Then in 2001 two messages appeared in a field close to a radio station very similar to the one our message went from. 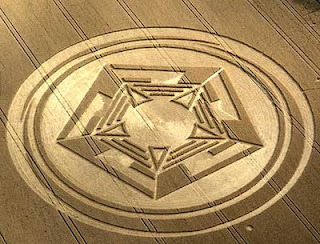 Sacred star tetrahedron. 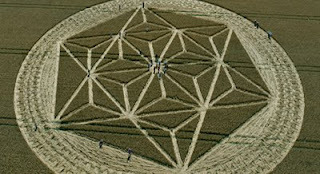 Centre star tetrahedron, metatrons cube, triangles on outside = cosmic radiation. Star tetrahedron and metatrons cube = evolution. 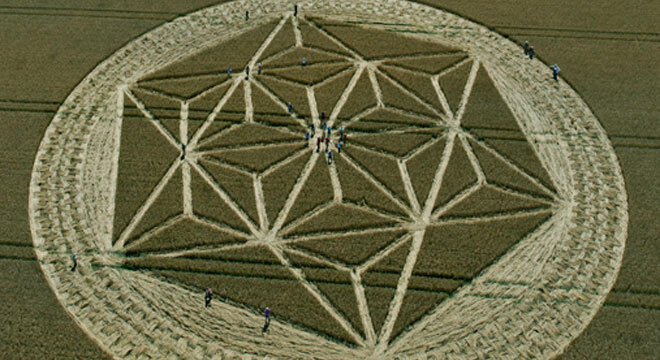 Pentagram sacred geometry for 5 elements fire, earth, air, water, light. The basic design for one of the largest buildings on earth, The Pentagon. 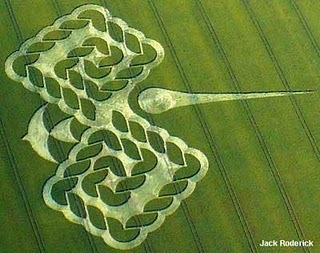 Cosmic holy bird = dark rift, cosmic radiation changes DNA. 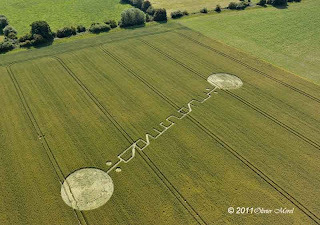 There are a number of circles that are predicting DNA changes in 2012, due to the radiation from the sun when the earth lines up with the sun. Earth's magnetic field changes into the shape of a "jellyfish" when it is impacted by a severe solar storm. 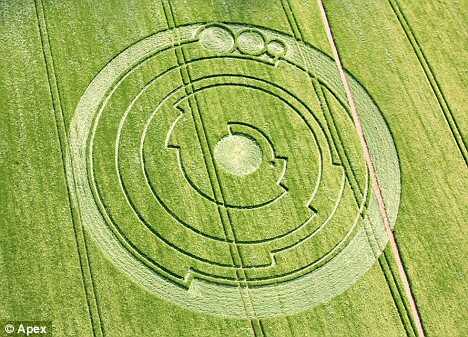 This crop circle is over 600 feet long. Freemasonic script - APPONO ASTOS. We are opposed to cunning and deceit. In some crop circles Uropium, Tellurium, Iodine 126, Bismuth 205, Protectinum 230, Vanadium 48 and Yttberbium 169 are found, which are not found in nature and are only synthetizable by synchrotron. There are more than 200 crop circles made every year, all over the world. Its a fantasic way of communicating with us as they will not have our language but they do use our mathematical system. 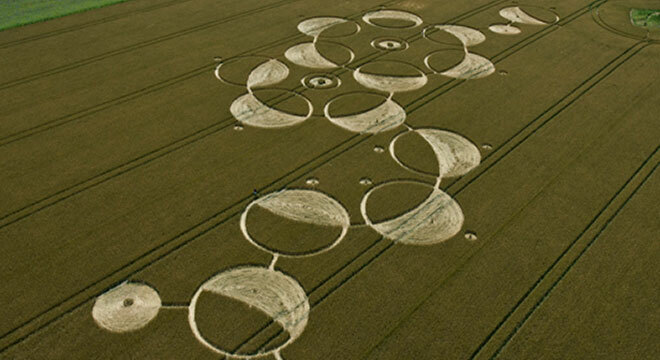 Whoever it is that produces these circles keep trying to give us warnings of future events, which for me means they can't be that bad. We may ask why are they so careful with us in their approach. 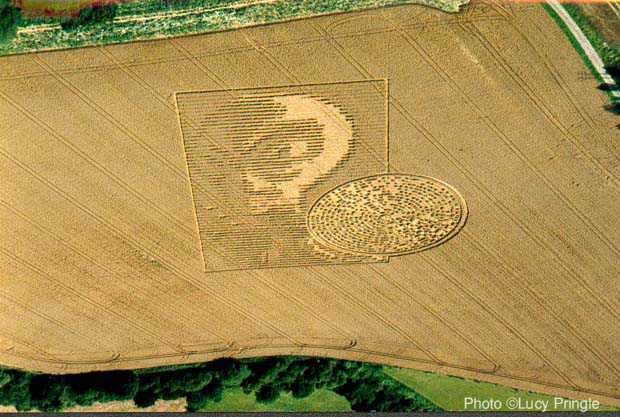 It is that they had been put to extermination already on Earth. The book of Enoch tells us that. 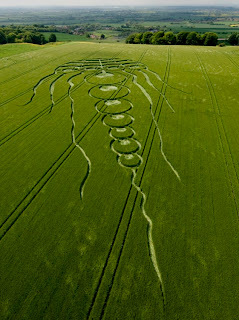 Since a long time they had been banished on Earth.There is still a secret war against them going on. The famous end of the world of Jesus which is near is that our planetary system has been destroyed by bombs. 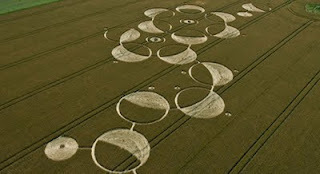 Moon, Mars and Venus have circles that are marks ob bomb. I suppose that we had been attacked by an armada from another sun, at that point our defenders had been declared Fallen Angels. The civilizations from our planets still existed and must live somewhere on Earth.